Our proprietary NIRS recording and analysis software. 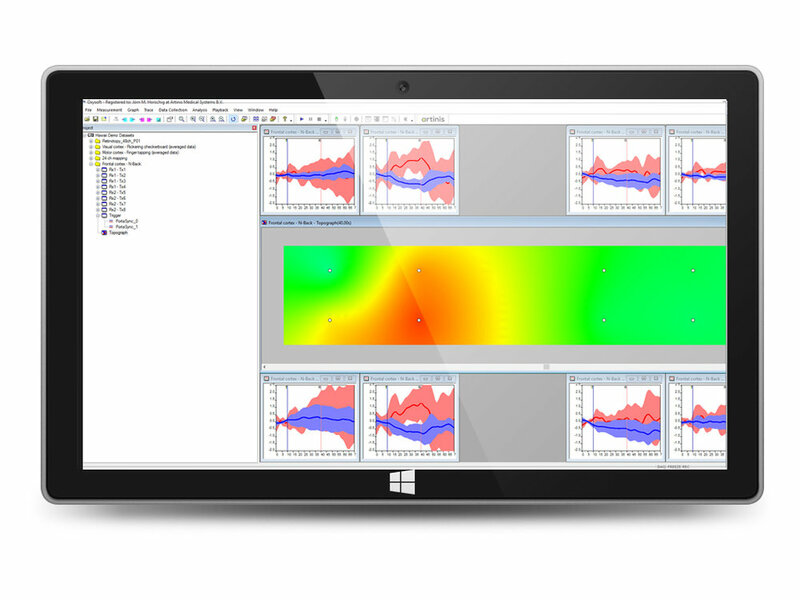 Oxysoft is our proprietary NIRS recording and analysis software. Oxysoft allows robust recordings even of multiple devices at the same time, in any thinkable combination. This means you can combine recordings from several Oxymons, Portamons, Portalites, and Octamons within one measurement by using just one program. All data is synchronized and stored in one data file. You can analyze your data in real-time, during the recording, or also afterward. Data from Oxysoft can be analysed in a variety of ways. First, you can analyse data from within Oxysoft. Oxysoft offers a variety of standard analysis techniques, such as filtering, averaging and statistical analysis. Second, all data can also be exported to standard data formats, such as csv, txt or xls file format. Third, we provide a MATLAB script, which allows importing your data obtained from Oxysoft directly into several MATLAB toolboxes such as Homer2, NIRS-SPM or FieldTrip. The script also allows importing the raw data, so that you are free to do any preferred analysis from within MATLAB. 15. Preparing videos of the 2-D plots, e.g. for presentations. Very useful for brain mapping! We offer the opportunity to access extended visualization options, designed to optimize your measurement protocol, better review your results, and to optimally support your high impact neuroscience publication. The Oxysoft 3D extension can visualize your data on 3D models of the brain of the human head based on the widely used MNI templates. Visualise your data on 3D models of the brain of the human head based on the widely used MNI templates. We have partnered with Polhemus Inc, which creates devices for digitizing objects such as the Polhemus Patriot or Polhemus Fastrack device. Using these devices you can precisely measure the position of the optodes on the subject’s head. Oxysoft 3D guides you through this process with a built-in, intuitive user-interface. No third-party software is needed for this process. Alternatively, you can import digitized positions from other manufacturers such as ANT’s xensor or Magstim’s EEG pinpoint device. Oxysoft automatically stores the digitized positions of the optodes, and transforms and then visualizes on the integrated 3D models. This not only allows you to better review your data and results but additionally allows to report back the optode positions in MNI coordinate space.